were welcomed with lots of screaming. I have to admit that I almost participated when drummer Jay entered the stage without shirt. But finally Gloria was well filled and the predominantly female audience made enough noise. They kindly put their hands in the air, when they were asked to do so, and they also replied to Jonne’s E-O-interlude-singings. Beside these stupid games, the concert was very good and in the crowd I got the same feeling that my parents used to have at Queen concerts. Negative played a good mix through all the released albums. 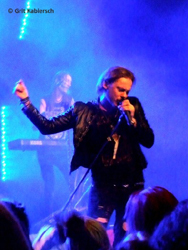 Too bad, that I will get to hear them again this year only on CD, since Negative are allegedly - according to media reports - pausing for the rest of the year and Jonne focuses on his solo-projects.